Livermorium is a synthetic element that was discovered in 2000. It is highly radioactive and unstable element. 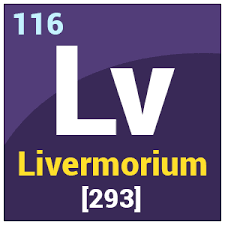 According to the Mendeleev’s nomenclature of undiscovered elements, livermorium was named as eka-polonium or element-116. Livermorium was synthesized by team of scientist working in Dubna at Joint Institute for Nuclear Research (JINR) and Lawrence Livermore National Laboratory, Russia in 2000 . They bombarded curium-248 (element 96) with calcium-48 (element 20) nuclei and obtained one atom of livermorium-293. Then in 2005, eight more atoms of livermorium were produced by repeating the make experiment. And during the experiment, another isotope, livermorium-292 was also discovered . The discovery of livermorium has been verified by RIKEN in 2016 and GSI in 2012. Its name was confirmed as Livermorium by International Union of Pure and Applied Chemistry in 2012, after the Livermore city in California. Its symbol is Lv and was selected in 2012 in a ceremony held in Moscow. Livermorium is an artificial element and does not exist in nature. It is extremely radioactive and thus is very unstable and only created in laboratory. Livermorium has been predicted to be a solid under normal conditions and a post transition metal. Only minute amount of livermorium have been produced so far and it is not enough to carry out a statistically significant analysis of its physical and chemical characteristics. However, it is predicted to be heaviest among the other chalcogens, including selenium, oxygen, polonium, tellurium and sulfur. Its density is predicted to be 12.9 g/cm3). Livermorium is present on the bottom of its group, below polonium. The melting and boiling points of livermorium is expected to be according to the trend in the group, and it will have lower boiling point and a higher melting point than polonium . There are two allotropic forms of livermorium, alpha and beta. The chemical characteristics of livermorium is not well studied yet. However, it is expected to resemble in characteristics with other members of chalcogen group. Livermorium belongs to the group 16 and period 7th of the periodic table. And is categorized as a 7p-block transactinide element. Due to the orbit-spin interaction and relativistic effect, it is presumed that livermorium may vary in certain properties from the lighter members of its group. The most common oxidation state of livermorium is +2, while other members of the group have +6 and +4. The hydride of livermorium, livermorane (LvH2) is the heaviest chalcogen hydride. Livermorium is used for research purposes. Livermorium is a highly radioactive element and requires special precautions with handling and storage. There are four isotopes of livermorium, and their mass numbers range between 290 and 293. They are unstable and unnatural. Livermorium-293 has a half-life of 60 millisecond and is considered as the most stable isotope of livermorium. Livermorium isotopes mostly decays through emission of alpha particles.
. Oganessian, Yu. Ts. ; Utyonkov; Lobanov; Abdullin; Polyakov; Shirokovsky; Tsyganov; Gulbekian; Bogomolov; Gikal; Mezentsev; Iliev; Subbotin; Sukhov; Ivanov; Buklanov; Subotic; Itkis; Moody; Wild; Stoyer; Stoyer; Lougheed; Laue; Karelin; Tatarinov (2000). “Observation of the decay of 292116″. Physical Review C. 63: 011301. Bibcode:2001PhRvC..63a1301O.
. Oganessian, Yu. Ts. ; Utyonkov, V.; Lobanov, Yu. ; Abdullin, F.; Polyakov, A.; Shirokovsky, I.; Tsyganov, Yu. ; Gulbekian, G.; Bogomolov, S.; Gikal, B. N.; et al. (2004). “Measurements of cross sections and decay properties of the isotopes of elements 112, 114, and 116 produced in the fusion reactions 233,238U, 242Pu, and 248Cm+48Ca” (PDF). Physical Review C. 70 (6): 064609. Bibcode:2004PhRvC..70f4609O. doi:10.1103/PhysRevC.70.064609.